Yesterday morning (July 11, 2018) I read an interview (sorry, in Dutch) with René ten Bos in Trouw, a Dutch newspaper, about the Dutch Climate Agreement of July 10, 2018. It contained a couple of references to the private sector and the systems approach, so I got interested. Here is my take of the matter. René ten Bos … is ‘National Thinker’, one might perhaps even say Philosopher Laureate of The Netherlands, since April 2017. He is a philosopher, author and organizational theorist who teaches at the University of Nijmegen, where he is Professor of the Philosophy of the Management Sciences. He says his drive comes from outrage (‘onderbuikachtige verontwaardiging’ on his Wikipedia page), which is the word used by West Churchman when he discusses the motivation of the ‘heroic systems philosopher’ in some of his books. The outrage in the article is about the convenience with which the Dutch private sector appropriates the term ‘sustainable growth’ for its meagre efforts to turn the Dutch Climate Agreement of the day before into some kind of a success. The inconvenient truth … is that the Dutch Climate Agreement lacks global impact, except – of course – if it can impact global decision-making, either politically or in green business development, which remains to be seen. This morning the Trouw editorial pointed out that Dutch industry wants the Dutch tax payer to foot most of the bill of the industrial energy transition. That hardly seems fair, but then globalizing industry could also pack its bags for higher grounds, lower labour costs, fewer environmental laws. And leave The Netherlands a lot poorer. Perhaps industry and ethics are not each other’s favourite company (unless ethics is paid by industry or industry dresses like ethics). Business ethics … is largely limited to Adam Smith’s invisible hand, which by way of the market trickles down its profits more or less socially and – in the very long run – also plays a role in curbing human population growth by raising incomes and bringing health. There is much less concern of business for global environmental and ecological impacts as we can see in the destruction of tropical forests, the extinction of species such as the rhinoceros, and global warming, which threatens global agriculture and coastal populations. It doesn’t seem to matter whether business takes place in the context of a deregulated Anglo-Saxon model or the totalitarian Chinese system. Market forces relentlessly shape the activity of the invisible hand. Are these forces sacrosanct or can we bring them under control? Or is that a contradiction in terms, just like sustainable growth. Whole-planet ecological consciousness …, according to Ten Bos, must necessarily be the answer to our climate troubles. The reason is simple. In 1867, now 150 years ago, Marx wrote, not thinking of any climate-induced flooding: “Après moi, le déluge! is the watchword of every capitalist and of every capitalist nation. Hence Capital is reckless of the health or length of life of the labourer, unless under compulsion from society.” Somehow, capitalism was able to transform itself into a benign system, although initially that seemed impossible. Wealth was not only generated, but also shared (after a while), leading to the demise of communism (unless the Chinese version could still be called that), demographic transitions (even to the point of declining populations), nature conservation, and democratic citizenship, holidays, education, mass entertainment etc. Out of synch The trouble here is that this social transition took place at the level of the nation state, whereas our environmental problems are of a global nature. Another thing is that the social transition only took place in the West, when the West ruled supreme. This ‘West’ shared centuries, if not millennia, of historical, philosophical and religious developments, making it more or less homogeneous and subject to the same contemporaneous social and intellectual forces. So the social transition took place at the level of the nation state in a more or less homogeneous part of the world, known as the West, in a period that the West knew few threats (apart from Comunism, Nazism and the like). The present world as a whole is not homogeneous at all, it is very, very much ‘out of synch’. The environment game .. is a book written by Nigel Calder (1931-2014) in 1967, in which he correctly predicted a world population of 9 billion in 2050. I think I bought it second hand in a Dutch translation in the early 1970s. In 1967 the world population was less than half of what is now, yet there were great concerns about agriculture feeding the world. By the time I ‘woke up’, there was the concert for Bangladesh (August 1971) followed by some of the more serious Sahel droughts of 1972-1974. And of course there had been famines in India in 1966-1967 (which led to the Green Revolution) and China in 1959-1961 (36 million died). Calder famously wrote: “If men were intended to work the soil they would have longer arms.” Calder combined trends (pollution, destruction of nature, automation of work, advances in bio-industrial production of food) to solve a combination of predicaments (food, population, nature, work). He didn’t solve the problem of leisure, though. Well, perhaps he did in a little way: I always liked his 1967 book for all its clever utopia-mongering (I borrowed this word from Arthur C. Clarke’s Report on Planet Three), so I reread it several times. The weather machine … is a 1974 BBC documentary, which is recalled in a 2007 Channel 4 documentary The Great Global Warming Swindle (you may like to watch from about 35m30s onward) with a special role for Nigel Calder since he was involved in both documentaries. The weather machine makes the point that an ice age is looming and CO2 may help prevent it. 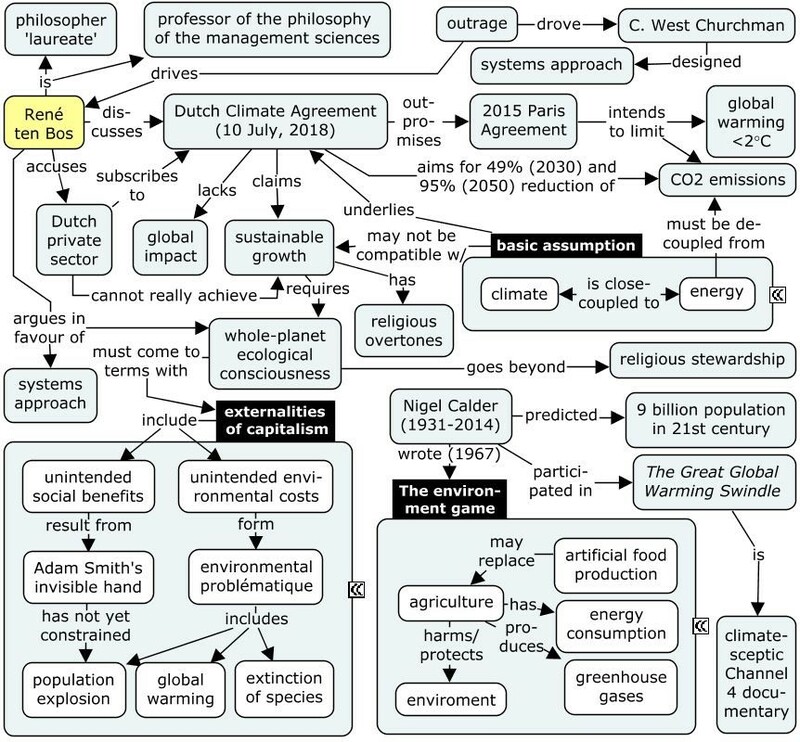 The great swindle suggests that the IPCC (Intergovernmental Panel on Climate Change) was perhaps not quite founded by Margaret Thatcher, but at least its creation was enormously advanced by her desire to create an energy-independent Britain with nuclear energy and destroy the mining unions. During my studies in the UK in the 1980s, that’s what I watched on television on a day to day basis: Scargill vs. Thatcher. Of course we also watched the Falkland War and Dallas. Flood risk One of the aspects of climate change is the threat of rising sea levels and associated flood risks (or perhaps we should already speak of certainty). Clearly the Dutch have reason for concern, living with 17 million people in an enormous delta that drains vast parts of continental North-Western Europe (Rhine, Maas, Schelde, IJssel). So a New Delta Plan has already been put into action to limit the risks until the end of the 21st Century to a minimum. The situation is very different in highly populated places such Bangladesh and most countries in South-East and East Asia, including China. More delta plans will be needed. The question remains to what extent we can or should shape deltas effectively, considering their complex geomorphological dynamics and the huge costs involved in protecting them. The right non-separability …. is at the root of all systems solutions. The basic assumption of the Dutch Climate Agreement (and the Paris Agreement to which it claims to contribute) is the close-coupling between climate and energy and the de-coupling of energy from CO2 emission/production. That’s just one kind of non-separability. It doesn’t say much about couplings with the rest of the world, globalized trade, world population growth, economic inequalities and so on. It is my humble view that we haven’t gone very far over the past half century, when the environment and global poverty became an issue. We need to invest in the capacity to address the climate issue. This can only be done by investments in getting the world more in synch without upsetting the golden goose, which is capitalism. This means we need to follow the basic rules of capitalism and combine them with innovative rules for igniting its transformative power. Tricky truth To me this boils down to a question of getting the world into synch: historically, philosophically and spiritually (to avoid the word religion, because that’s bound to divide us further). All three are about truth. Since the world is historically, philosophically and spiritually (and perhaps even racially) divided, we need some form of pluralistic truth with sufficient room for the partial truths of different parts of the world and sufficient concordance between these partial truths to create a politically effective pluralistic truth (without it turning into a totalitarian truth). An open-ended model for designing an appropriate response to the ‘human predicament’ has been described by Hasan Özbekhan (a systems thinker in the school of Churchman and Ackoff) in his 1970 proposal to the Club of Rome. When I say “open-ended model” I mean that it doesn’t make any assumptions beforehand about which forms of non-separability should prevail (e.g. as suggested by me just now) or provide an overall framework. Any such assumptions can only emerge in the course the, no-doubt lengthy discussions during the design period (which may never end, especially if there is room for redesign and adjustments). Implementation … is key to systemic solutions. It is human to think systemically, i.e. to make observations of controversial separability (and become outraged or not). But to think systemically as well as effectively is where the real challenge lies. It means that we somehow have to identify the right non-separability, but also the right way of looking at that non-separability, and developing a way of handling that non-separability in a way that really (i.e. effectively) improves a problematic situation (or problématique), of mankind or at a much smaller scale (say of a nation like the Netherlands). Implementation is a central category in Churchman’s categorical framework for a dialectical systems approach. Read his books or watch his video. See also my transcript of his two-hour interview. 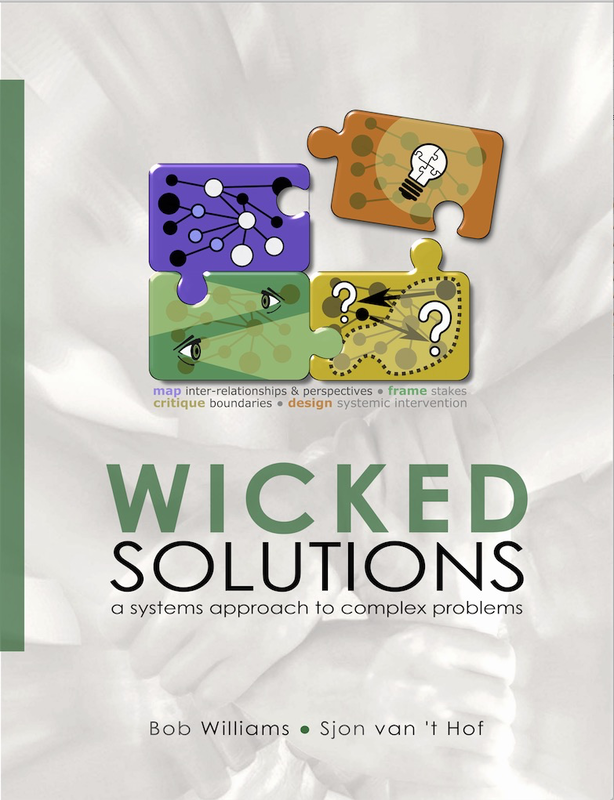 You can support my work (of writing an even more convincing sequel) by buying Wicked Solutions at Amazon.com. You will support me even more if you buy at Lulu’s. There is also a PDF at Gumroad for only $12. Your thinking will never be the same.